I thought I would include an appendix with some information on surface hunting in order to impart some general “treasure awareness” to my readers. Surface hunting is not (for most of us) about finding arrowheads although that may be what comes to hand. Surface hunting is a mindset—or rather an open mindedness to the possibility of finding treasure by eye. As a beach hunter, about half of the gold I find comes from just being in the right place and remembering to look as I detect. 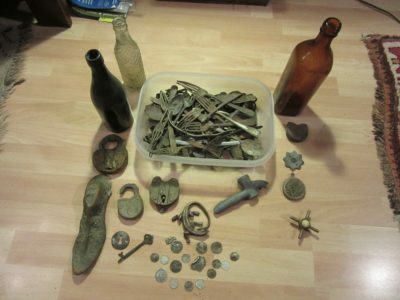 It’s worth noting that most of these finds are ones I just barely saw as I stepped forwards to begin another coil sweep. Point being that the more open you are to eye finds the more of them you will make. As well, part of being versatile is having other ways to recover treasure than with a detector. What can you find by eye? You can find: valuable bottles, old tools, caches of liquor, or redeemable empties, native artifacts, clay pipes, coins, paper money, jewellery, valuable artifacts, designer sunglasses, scrap copper, brass aluminum and lead, electronics that have scrap value—the list is endless. Anyone who had watched an episode of one of those “Storage Wars” type shows knows that a big part of defining what treasure is involves recognizing the sale-ability of something—having the contacts to move it. A pal of mine posters neighborhoods asking for any scrap lead batteries, then drives around the following week to collect them. He then scraps out the lot for usually about $500. Another pal of mine did a lot of eye searches of old areas. One of his best finds was a large ball of soft drink labels bearing the name of a local company: “Wilson” (c. 1930). John (see below) found this ball of labels and quickly recognized that there were about 25 complete sets of all the half-dozen or so varieties of pop that the Wilson company made: Ginger Ale, Cream Soda, Root Beer and so on. John soaked this ball for months to separate these labels and pasted each set into frames. These very rare sets sold for $900 to $1200 each—quite a haul. Point is that treasure is in the eye of the beholder. What equipment do you need to surface hunt? The most basic tools are a pack-sack to carry what you find and a stick—to literally “poke around” with. Each year the large beach near my house hosts several fireworks displays the attract huge crowds. Because people don’t really sit and formally “beach-go”–there isn’t much in the way of coins to be detected. However, several of us walk around with packs and sticks just examining what’s on the ground. Some great finds have been made this way including big gold bracelets, designer sunglasses, paper money—all kinds of things—just with a stick. These are all handy tools to have and once you get the surface hunting “bug” they will be made good use of. Where can I find surface treasure? There is just no end to the number and variety of places where there is treasure to be found by eye. It’s also important to recognize that at shoreline sites, there is constant change. Wind, rain, tidal erosion—all these act to expose treasure. Also, as touched upon earlier, often classification can sometimes do part of the work for you—bringing the heaviest, densest targets together into certain areas of shoreline. My surface hunting “mentor” John, specialized in digging bottles at the outside corner of rivers. These were bottles and ceramics that had been carried downstream and deposited on the outside corners. Some of the ones he found this way were contents intact and very valuable. A 14k ring fragment spotted amongst incinerate scrap. At many locations its possible to discover patterns as to where certain types of objects are carried by the current. At one Caribbean site I hunt a local guy has found a “sunglasses mine” where hundreds of designer glasses are carried by the current. He is there daily in a sea kayak popping in and out of the water retrieving them. I have a spot nearby where beer cans from a peninsula are carried to the mainland by the current. These wash up in a single spot and I fill a garbage bag with about $10 worth every visit. As with detecting, all these ways of finding proceed from observation—and awareness. On the beach–just as with detecting the key is to get into the high traffic areas—at first light if possible. When you are at the right location at the right time, eye and detector searches are interchangeable. 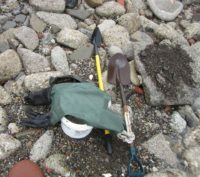 These are mainly methods for finding small objects in sand or soil. A well made sifter can be used with floats to detect in the water with too. While I won’t include plans for one, materials used can be wood, a “bread rack” or PVC pipe. It’s best to avoid any metallic materials so that it can be used in conjunction with a detector or pinpointer to locate objects on the mesh. The mesh itself can be square grain 1/4” plastic “chicken wire” available at Home Depot and other stores. For in-water use, “pool noodles” can be attached around the outside with “zip ties” and these can be removed for inland use. This sifter can be placed upon four rocks in shallow water, or suspended using a long pole anchored at one end, two upright struts, and four suspension ropes to keep the sifter up and clear of the ground so that material can drop though. This is a great system for examining large amounts of dirt of sand for artifacts. “Boarding” is something that’s widely done in England on the tidal flats of the Thames River. A large board is placed on a dry area of the mud and material is shoveled up onto it. This material is then examined by hand and / or detector. This can be a bit messy but it’s a great way to search for treasure. An alternative is to place your board up on the beach at an old or busy section of beach then wade out into the water and fill buckets with sand. Then walk these back and dump them onto the board. When the board is full, rest your shovel and go in and sort though the material by hand. 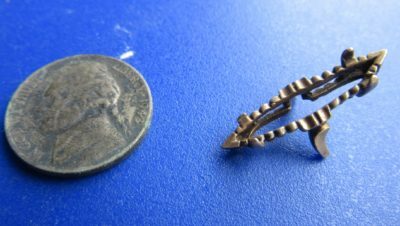 At my local shoreline, incinerate was dumped from the 1920’s through to the 1950’s and we have found a lot of gold jewelry, silver coins, brass, copper and lead scrap and artifacts this way, where as to operate a detector would be impossible. How do I develop my surface hunting skills? Part of developing your “eye” is to know what you are looking for. When I met with John at a coffee shop—he found a gold earring right there where the lineup stands. I recently found a gold ring in several feet of water at this incinerate site. While it was a small ring—I’m still surprised by just how much the color stood out. This ring had been there since the 40’s or so and had long since lost it’s gold shine—but just the pale yellow was unmistakable—when you know to look for it. Anther thing to look for is “ornateness.” At this site, a lot of objects of interest are distinguishable by just how intricately patterned they are. 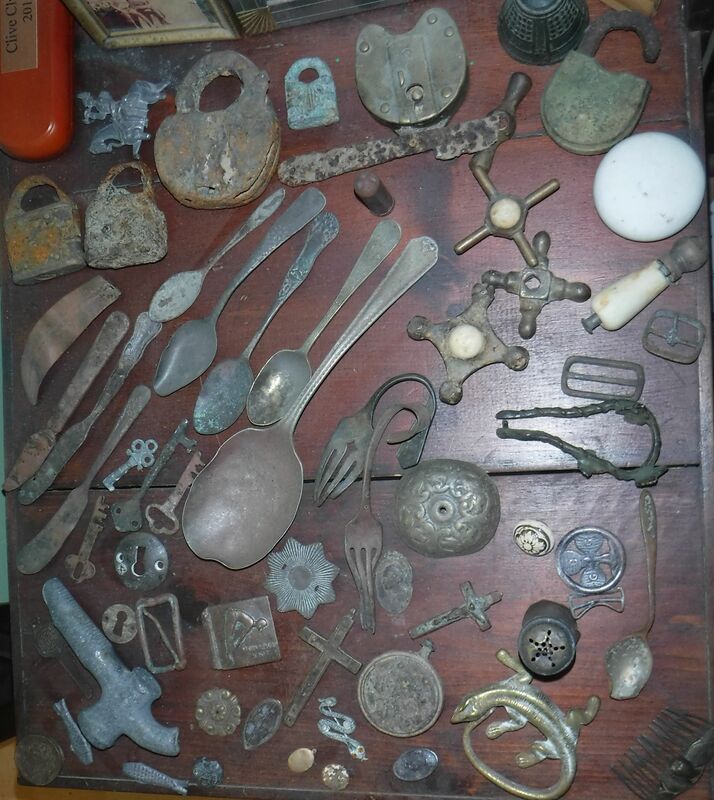 These will be the “designer” objects of the day and more likely to be jewelry, embellishment, or other objects that are interesting or have value today. While many of these aren’t of any value, it’s fascinating to see the degree of care and craftsmanship that went into everyday household objects in those days. I also look for paper money—in parking lots, snow piles, after events. This is a real skill too in that not all of a shining $20 bill will always be there for you to see. More typically you will spot a mud-covered—corner or shape. The key is to learn to break what you are looking for into components—the edge pattern of a bill—the numbering, the color, the shape, the size (even folded in half). When you can spot a bill by any one of these features—you have some solid eye skills. I do this in the water too. Where there are big crowds I often lie down and scan across the top of the weed mass. Quite often there will be paper money rolling around with the weeds and other debris. Also, on the beach, when you are walking into the sun quite often anything shiny will flash up—something to be aware of. I’ve found a lof of gold this way—often at day’s end when the sun is low in front of me. The key is to have certain “markers” in mind—green, gold, unusual, anything out of the ordinary should attract your attention and warrant further examination. This kind of hunting carries with it certain ethical considerations though. To begin with it’s illegal to trespass and even if you get permission to search private property the owner may still have claim to anything you find. There are however, salvage agreements that can be entered into for any high potential sites you encounter. At the same time, don’t let anyone else steal all of the benefit of your efforts and treasure hunting savvy. Also, anything you find by eye on the beach is more likely to have been recently lost. Be prepared to look for the owner and to return items when possible. It’s really the thrill of the find that counts anyhow. Finally, keep safety in mind—especially if you have any young hunters in training with you. Old areas can be full of hazards—spikes sticking up, falls, sharp objects…be careful. This is especially true of snow piles. These can be very dangerous as well—especially in spring when they are melting. These piles can have soft spots or deep mud around the edges. Always walk with a sick or spade and carry a cell phone. No find is worth courting disaster. That said, surface hunting and Artifacting is a great hobby in and of itself. I mention it here though because of what it has to teach. When you bring heightened awareness and a focus upon key areas of a site to your detecting you are bound to have more success. Surface hunting teaches you to find these locations and look for ways of searching that others had not considered—to consider the possibilities. A Few Surface Hunting Finds. 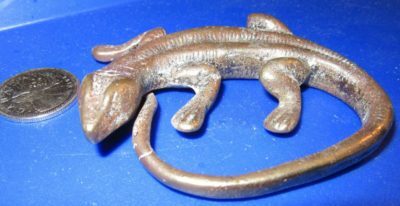 The coiled lizard paperweight is a fave.